Switch It Up This Year and Have a Mexican Thanksgiving! Switch up your Thanksgiving this year by having a Mexican Thanksgiving! Traditionally, Thanksgiving consists of turkey, mashed potatoes, ham, green bean casserole, cornbread, and pumpkin pie. However this Thanksgiving, you can wow your guests by sliding in items from our menu to add a Mexican Thanksgiving flare. You and your guests will be blown away at how well our items actually compliment a traditional Thanksgiving dinner. People usually provide snacks ranging from pretzels and peanuts to salami and crackers. This Thanksgiving, try our nachos and supreme fries instead. With your choice of tortilla chips or French fries, you can have black or pinto beans, along with melted cheese, pico de gallo, sour cream, and guacamole. You can have the nachos or supreme fries with steak, al pastor, rotisserie chicken, chipotle chicken, or shrimp. To compliment your Thanksgiving meal with white meat like turkey, we suggest using chicken for your nachos or supreme fries. Tired of boring chip and dip? 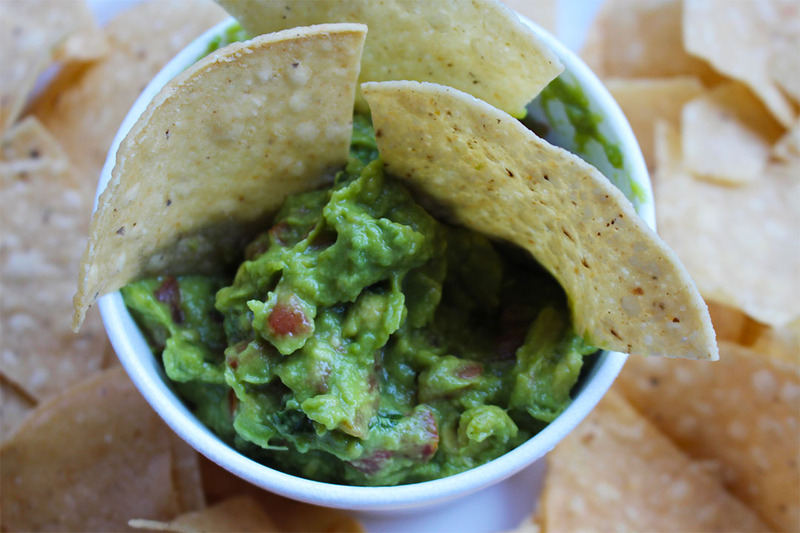 Try ordering our guacamole as the dip you can use for your chips and crackers. You can taste the richness from our guacamole in every bite. Made from fresh avocados, we splash just the right amount of lemon juice to balance the richness out. Swap the chips out for tortilla chips and your guests will be thankful for the appetizer, while they’re anxiously waiting for the turkey dinner. Your Thanksgiving sides will be even easier with side dishes from Benny’s Tacos. Instead of green bean casserole, macaroni and cheese, or mashed potatoes; try swapping the dishes out for beans or rice. Looking for something that goes well with cornbread? Our tasty pinto beans are seasoned to perfection and the texture of our refried pinto beans really contrasts with the flakiness of cornbread, creating a yummy pair. Interested in adding a little more meat to your meal? Try ordering a few of our rotisserie chicken wraps. Our wraps are created in a fresh flour tortilla with lettuce, avocado or guacamole, cheddar/jack cheese, and finished with chipotle sauce. By using side items from Benny’s Tacos you’ll be able to spend more time on the turkey and dessert, than worrying about side dishes. Not interested in cooking turkey this year (after all it takes hours to cook) or just simply couldn’t find one because it was last minute? Benny’s Tacos has you covered! We have slow-cooked rotisserie chicken that is marinated with garlic and special herbs. In fact, three of our whole chickens can be used in place of one turkey, to feed all of your guests. Our rotisserie chicken menu is a popular favorite at Benny’s with options like, whole, half, and quarter. For a holiday like Thanksgiving you might want to order our family combo with two whole chickens with your choice of two sides and a side of guacamole, garlic paste, and tortilla chips. This combo also comes with a choice of flour or corn tortillas. With so many options to choose from on our menu, you can spice up your Thanksgiving this year giving guests memorable choices like our appetizers, sides, and chicken items. At Benny’s Tacos, we pride ourselves on cooking up delicious authentic Mexican food. Any of the items on our menu will help you create the dining experience you want this Thanksgiving and your guests will appreciate the different spin this year! There’s a school event and you need everyone fed. Maybe there’s a board meeting among teachers; classroom 7 scored the highest on their last test; the local baseball team hit the winning ball; or it’s just a fun gathering of coworkers. Whether it’s a business meeting or a celebration, you need to cater the event, and the tried and true method is pizza or sandwiches—they’re fast, cheap, and easy. Those foods also give the impression the main concern is keeping the guests full over actually providing a good meal. You don’t need to take the easy way out. Why not make the occasion a little more memorable with some delicious, authentic Mexican food? Your staff and students deserve a reward for their hard work, and Benny’s Tacos is here to cater your school event. Benny’s Tacos has catered hundreds of people in the L.A. school district; we’re more than happy to serve those who nurture the education system. We don’t talk down to our customers by cooking false Mexican food; everything on our menu is authentic. Alongside items such as special tacos, wet burritos, and carne asada plates, we also provide rotisserie chicken, seafood, and vegetarian options. In addition to schools, Benny’s Tacos has been called upon to cater for a number of corporations, including Google and Hulu. Our professionals can satisfy anyone, whether multimillion corporations or a classroom, by providing the best services possible. We care about education and Benny’s Tacos has your school’s full support in providing excellent food for your event. Make that board meeting less stressful with some rotisserie chicken. Reward classroom 7 with some tacos. Give your support to the baseball team with a big wet burrito. We’re here to help. Mmm, is there anything better than a good piece of rotisserie chicken? Whether you’re grabbing lunch in the middle of a long day at the office or looking for the perfect late lunch to punctuate a lazy Sunday afternoon, it always seems to hit the spot. When the meat is soft and tender, with just the right amount of seasoning and the perfect sauce on the side… we just made ourselves hungry just by talking about it. For the uninitiated (shame on you) rotisserie chicken is a dish where the entire chicken is skewered by a single metal rod and either placed over a fire or roasted in an oven. In logical terms, it’s popular because it cooks the meat evenly and makes it easy for the cook to baste the chicken at precisely the right moments. But that’s just the logical side of it – in our hearts, we know that we love rotisserie chicken best because as the meet turns over the open flame its infused with the taste of Heaven. 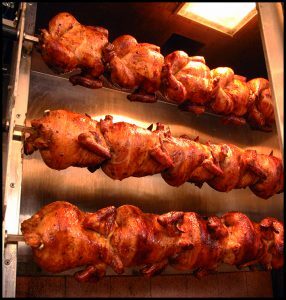 Rotisserie chicken is a specialty at Benny’s Tacos, one of the dishes that made our famous and which keeps our loyal customers coming back week after week. We serve free range chicken, lightly seasoned with just the right amount of spices to give the tender meat a bit of kick. We offer a range of size options, ranging from half a chicken for a light lunch to a two full chicken combo meal that’ll feed a troop at a bargain price. 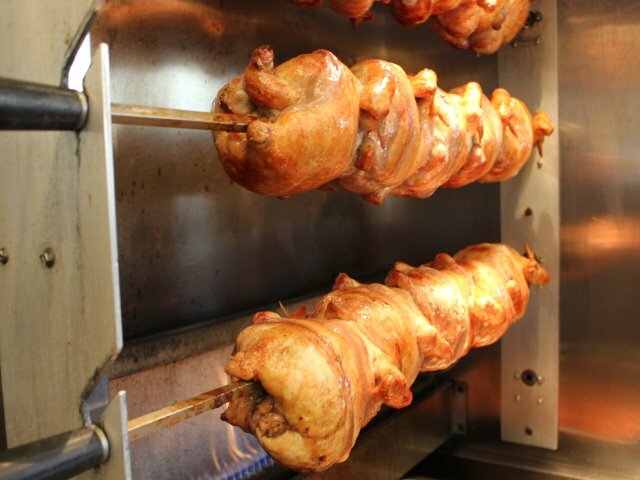 You Haven’t Had Chicken Until You’ve Tried Benny’s Rotisserie Chicken. Come on Down and Try Something Special. You Owe it to Yourself. 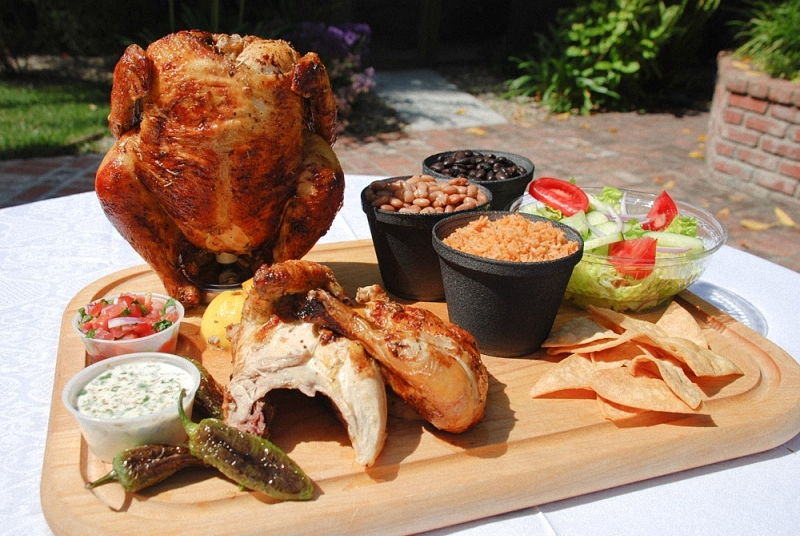 All of our rotisserie chicken dishes come with garlic paste, tortillas, tomatoes, and shredded lettuce. If you are looking for the best of all worlds, visit us on Monday, when the half chicken plate is one of our specials. Get our signature rotisserie chicken meat and sides for the scandalously low price of $7.25. Looking for a classic dish prepared with unparalleled skills and for a low price? The only place you’ll find your heart’s desire is Benny’s Tacos. Indulge in Vegetarian Mexican at Benny’s Tacos and Chicken Rotisserie! Vegetarianism is steadily becoming more and more of a trend. According to a 2012 Gallup poll about 5% of Americans consider themselves Vegetarian, meaning they abstain from eating any type of meat. People choose to be vegetarian for a variety of reasons including health, moral, and religious beliefs. Furthermore, more and more studies are showing that protein requirements can be aptly met through a vegetarian diet. Living in Los Angeles, it is not uncommon to see a vegetarian or even vegan restaurant around town. LA culture prides itself on maintaining a healthy and fit lifestyle, and as such, many Angelenos practice vegetarianism or simply enjoy vegetarian cuisine. Perhaps one of the most challenging aspects of becoming a vegetarian is not being able to enjoy favorite meat-based dishes. Here at Benny’s Tacos and Chicken Rotisserie, we understand that in order to satisfy every customer that walks through our door, we have to provide a variety of tasty vegetarian Mexican dishes. A quick look on our menu will show you that we have vegetarian tacos, burritos, and quesadillas, filled with either grilled vegetables, beans & cheese, or portobello mushrooms. You can still enjoy authentic Mexican flavors and spices without having to include the meat. We also offer several vegetarian breakfast options, including our wildly popular breakfast burrito (simply ask for no bacon), omelettes, pancakes, and enticing huevos rancheros. If you’re craving Mexican, breakfast, or and are strictly vegetarian, Benny’s Tacos and Chicken Rotisserie has got you covered. We have vegetarian Mexican cuisine offering fresh and unique dishes that will keep you coming back for more! Takeout food in Westchester is not hard to come by. No matter where you are in Westchester, turn around and you’ll find half a dozen eateries that offer takeout food. Any time of day, any type of food, any quality of food—you’ll find it. Westchester and the neighboring Santa Monica are world famous for boasting a variety of diverse foods and diverse people. But where can you go for reliably delicious, reliably priced Mexican food when you want takeout food in Westchester? Benny’s Tacos should be your first stop, and we’ll tell you why. If you missed our post about our reliably tangy, reliably chunky, smooth guacamole, then it’s a must-read. And we’re not just teasing you; if you live in the Los Angeles Westside, then any dish you read about on our website is merely a few minutes’ drive away from where you are. Our Westchester location is centralized to accommodate visits from all over the Los Angeles area. Looking for takeout food in Westchester? 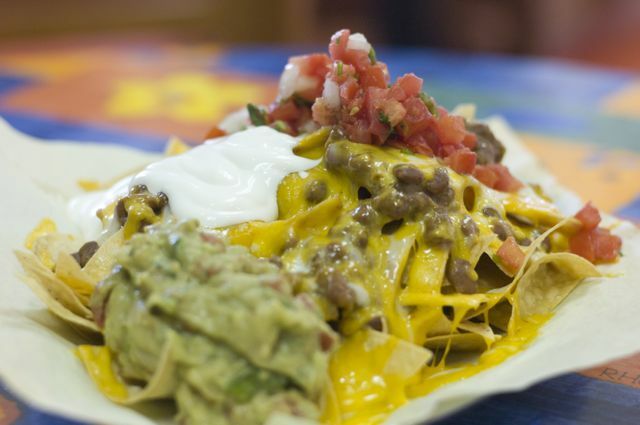 Benny’s Tacos offers the most reliably delicious, reliably well-priced Mexican food around. What about the post about our tantalizing garlic-infused chicken? We promise that once you taste our garlic- and lemon-infused chicken, you’ll never think of chicken the same way again. The taste notes are subtle but invasive; your taste buds will appreciate the service Benny’s Tacos rotisserie chicken provides. Both of these famous Benny’s Tacos dishes—and many, many more—are available when you want takeout food in Westchester. Forget about rushing home after work only to stress out over what to make when you get there; come to Benny’s Tacos and treat the whole family to a tasty meal. For an area that’s always bustling with activity, the option to order takeout food in Westchester can improve any family dinner, business meeting, social gathering, and even food-fueled trips to the beach near-by. In Los Angeles you can find Mexican food anywhere, but finding reliably delicious Mexican food is a great strength to have. The holidays are here! Whether that means you have good times in store or tedious times to come, the holidays almost always mean there are serious holiday meals to be eaten. But what kind of meals will be served is entirely up to you. Sure, we go through the holidays usually eating the same dishes: turkey and ham for Thanksgiving, and then, just one month later, we try and make our Christmas meal more interesting, even though it, too, is made from turkey and ham. Maybe duck if you’re lucky. If you recognize this situation, then you have two options. Your first option is to ditch tradition. Forget turkey, ham, and even duck. Ignore the desire to whip up some easy stuffing or cranberry sauce. There’s a time and a place for everything, but holiday meals don’t need to be predictable or boring. Surprise everyone! Try setting a theme for all the food that will be served, or pick only new recipes to cook for a fresh take on a grand holiday meal. If you’re having family over, consider the demographics of the group. If there are children in attendance, try putting together some decadent nachos, garlic French fries, pigs in a blanket or even onion rings. Consider serving personal sized steaks or enchiladas for something a little different. Take a chance and make your holiday dinner a little unconventional. Your second option is perfect for those of you not in control of your holiday dinner. Sometimes you just can’t change what’s on the menu, even if you’re not interested in having yet another predictable holiday dinner. And in that case, your only option is to prepare for the expected. Stop by Benny’s Tacos and fill up on the food you do love before you’re forced to eat the food you don’t. Remind yourself what perfectly marinated chicken tastes like. Learn how to full appreciate a carne asada plate. Try our shrimp tostada ceviche for something entirely new. We have Mexican and rotisserie chicken options at Benny’s Tacos because we know that when you’re craving delicious food, you want options. Don’t let your traditional holiday meals bore you. Come to Benny’s Tacos to make your holiday meals an experience to remember. Westchester is an area world-renown for its beaches, sunshine and friendly, accepting atmosphere. On any given day you can meet a stranger and share your story, learn something new, or explore a part of the city you’ve never noticed. Westchester offers a host of opportunities for adventure, and the approach of winter does not mean this beach town is going to shut down. As we all know, winters in Los Angeles deter few from visiting our storied beaches, which means restaurant locations near to the beach like Benny’s Tacos are perfect for beach days with friends all year round. Stop By Benny’s Tacos on a Tour of L.A.
No tour of Los Angeles is complete without a trip to Westchester, so maybe it’s finally time to invite your friends from out of state down to walk the gold-paved streets of the city of angels. But if you’re going to visit Westchester, why not stop at Benny’s Tacos for our signature guacamole or mouth watering chicken? Affordably priced with a comfortable ambiance, Benny’s Tacos is the perfect place to stop with good friends looking to have a good time. Sun, friends, and good friends. What more could you need? 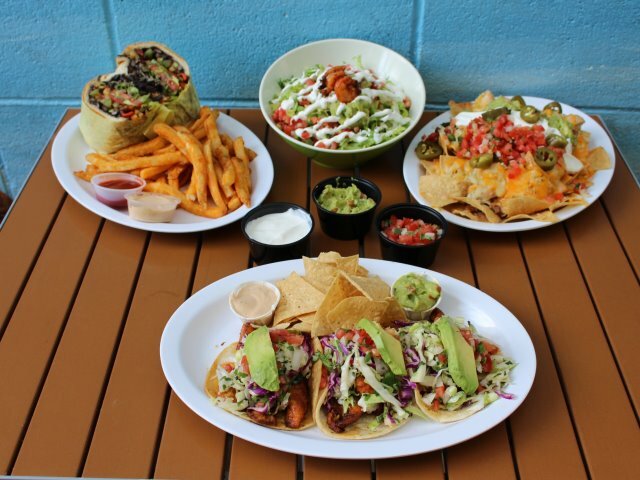 If you’re tired after a hard day of surfing or looking for energy before you paddle out on some major swells, Benny’s Tacos is in the perfect location to make your cravings a reality. Offering authentic Mexican food and delectable rotisserie chicken, Benny’s Tacos will satisfy your needs, filling your stomach for an agreeable price. The advent of winter doesn’t mean that the allure of Los Angeles beaches diminishes in the least. Westchester will maintain its sunshine and Benny’s Tacos will fulfill your desires. Just walk through the doors and our menu will do the rest. We’ve cemented our place in the list of Westchester institutions because we do what all good food locations by the beach do best: we remind you that all you need for a good day is sunshine, good friends, and good food.